Delaware Area Career Center senior Hannah Peterson accepts her second-place trophy in the graphic design promotion category of BPA’s state competition. Peterson said she had to design a logo and poster for the National Leadership Conference and do a presentation to a panel of judges. 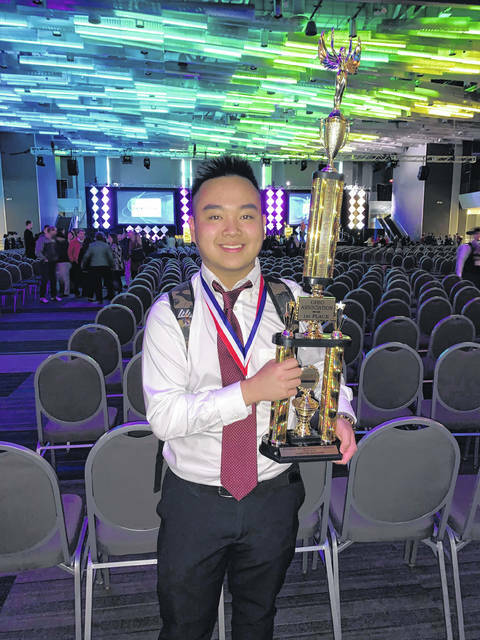 Olentangy Orange High School junior and DACC student Khang Van took home first place at the BPA’s state competition. Van said he designed a 3D model of the Santa Monica pier. 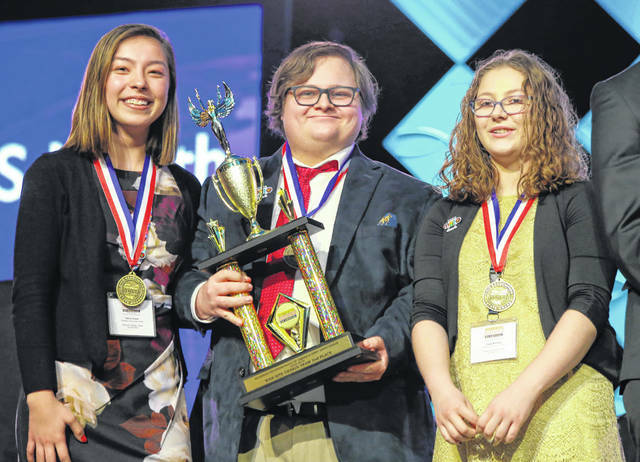 From left to right: Delta Clark, Devin Mantz and Jada Millisor accept their second-place trophy in the Business Professionals of America state competition last month. The team had to design a website for the National Leadership Conference and give a presentation about the site and their process. Fourteen Delaware Area Career Center students will be heading to the Business Professionals of America National Competition in California next month. • Khang Van took first place in the computer modeling competition. • Casey Campbell and Rachel Gaddie will be heading to nationals for the second year in a row after they were ranked in the national top 10 in the virtual multimedia promotion category. • Hannah Peterson is also going back to nationals for the second year in a row after taking second place in the state graphic design promotion competition. • Reese White, Brian Whitesel, Madison Dyll and Kasey Runyon took second place in the video production category. • Matt Hanks, Bryce Dietrich and Lee Morris took second place in the computer animation team category. • Jada Millisor, Devin Mantz and Delta Clark took second place in the web design category. Van, a junior at Olentangy Orange High School, said for the computer modeling competition, he had to use a software called Blender to create a 3D model of a pier. Van said he chose the pier at Santa Monica and spent two months learning the program, which he had never used before, and creating the pier. Van added that at the competition, his model was judged and he had to give a presentation to a panel of judges about the model and the software. Van said he was surprised when he took first place in the state competition. Van said he hopes to pursue a career doing 3D modeling for advertisements, movies or video games, and he added the competition was a valuable learning experience. Before resubmitting the project for nationals, Van said he added a few more details to his model of the pier to add extra complexity. Peterson, a senior, said Thursday that she’s had her eye on the national competition ever since she learned during a seventh-grade trip to the career center that it would be in Anaheim in her senior year. Peterson said she went to the national competition in Dallas last year, and she isn’t as nervous for this year’s competition. 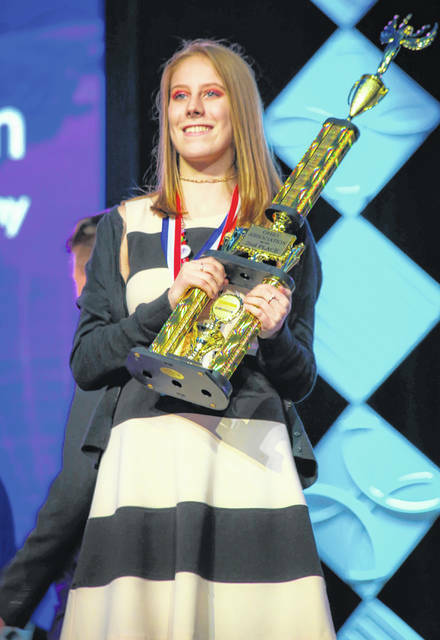 Peterson credited her instructor in the digital design class at the DACC, Wil Rowland, and said his encouragement and honest feedback is part of the reason she made it to nationals again. “Before I started (at the DACC), I wouldn’t have been able to talk to people or do presentations, and I never would have been able to go to nationals,” Peterson said. The web design team of Millisor, Mantz, and Clark said their team was a collaboration between two digital design students with different strengths, Millisor and Clark, and an app development student, Mantz. Millisor explained the team had to create a website for the National Leadership Conference, and that by combining skills from herself, Mantz, and Clark, they were able to create a website with solid technical and artistic designs. “We decided that we wanted to crossover to build a more effective website,” Millisor said. Mantz said he was thankful that Millisor and Clark both had at least some coding experience going into the project, which they’ve been working on since the start of the school year. “There was a lot less of a gap that had to be made on my part, so that made it a lot easier,” Mantz said. Clark said the team created the website and had to do a 10-minute presentation at the state competition. She said she “freaked out” when the team learned they would be going to nationals. Clark said the team and site have grown a lot throughout the project, including multiple meetings and changes they had to make over their spring break. Millisor and Clark said the team wouldn’t have gotten where it is without the instructors at the DACC. “I’d go to (Rowland) and say ‘tell me everything that’s flawed with this,’” Millisor said. The team said it would be practicing for the next month before the competition.